Known for superior European standard quality, Stone Hub is proud to offer a wide range of white pool tiles by Aqua Mosaic. Aqua Mosaic tiles have been developed through consultation with leading industry designers, key specifiers and experienced contractors. Designed and tested for Australian swimming pools, they offer exceptional durability, a smooth finish and brilliant colours. Furthermore, they are resistant to acid, salt water, ozone, chlorine, bromine and algae. 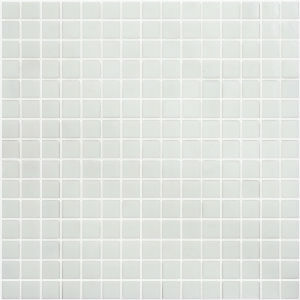 If you’re looking for a selection of white pool tiling, you’ll find it here at Stone Hub. Featuring a variety of white tones, you’re sure to find exactly what you’re looking for in our range. For more information, or if you require any assistance, please get in touch with our friendly team in Sydney today. We can provide you with further details, samples and useful advice. Call us on 1300 668 394 or get in touch with us online through our contact page.